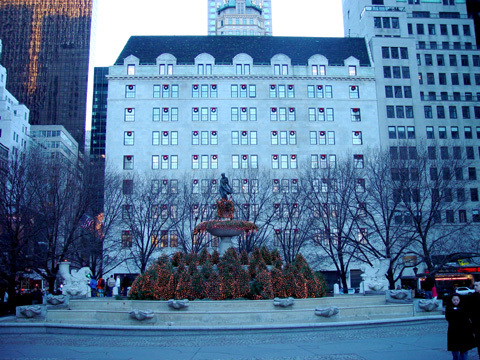 A simple though elegant, mansard-style building, Bergdorf Goodman, shown in the center above, deferred to the Edwardian heavy detail of its dowager neighbor, the Plaza Hotel (see The City Review article), also fronting on the south end of Grand Army Plaza, and made a handsome transition to the similarly inspired but much larger Savoy Plaza Hotel across the avenue. 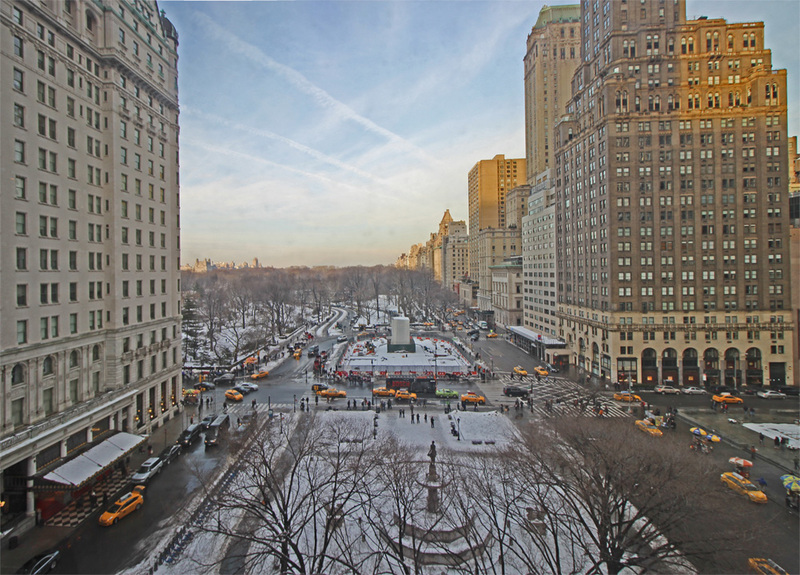 Together with the slanted mansard rooflines of the Savoy Plaza and the Pierre Hotel, three blocks north on the avenue, the Bergdorf Goodman store made an exploded scale Parisian enclave at the major entrance to Central Park. 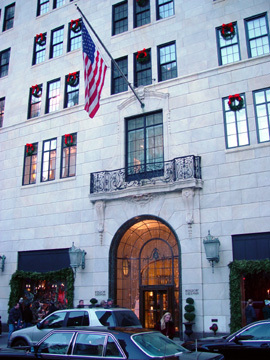 Because it also extends to 57th Street, where its corner has long been occupied by Van Cleef & Arpels, the jewelry store, the building has significantly contributed to the elegance of that famous intersection as can be seen at the right from a terrace that was above the Bonwit Teller Store that has been replaced by a Nike Store. Inexcusably, the Savoy Plaza Hotel was razed to make way for the General Motors Building (see The City Review article) almost destroying the neighborhood, the city's finest for virtually the entire 20th Century. 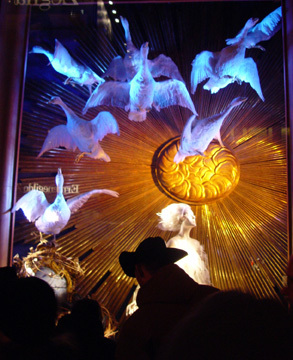 As one of the city's most expensive and exclusive stores, Bergdorf's, however, not only has stood its ground but expanded across the avenue to take over the retail space vacated at 745 Fifth Avenue (see The City Review article) by F.A.O. Schwarz, the famous toy store that relocated into the General Motors Building. The remodeling of that building in 1988 by Hammond, Beeby & Babka slapped on an Art Deco-like, new base that was not exceptionally detailed, but not tacky. 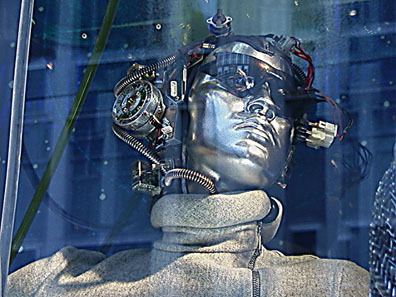 The main Bergdorf store, noted for its artistic store windows, used the relocation of its men's store across the avenue to redesign its own interiors, which were handsomely opened up considerably. Andrew Goodman, an owner of the store, maintained a large apartment on the top floor, but store patrons have been able to enjoy spectacular views to the north through some of the boutique windows in the building. The site was formerly occupied by the huge Cornelius Vanderbilt II mansion, designed by George B. Post and his teacher, Richard Morris Hunt, with decorations by John La Farge, Augustus St. Gaudens and William H. Low. The turreted, chateau-style mansion is depicted in one of Everett Shinn's large murals in the Oak Bar at the Plaza Hotel. A large ornamental gate from the Vanderbilt mansion was installed at the Conservatory Garden in Central Park at 103rd Street. The Andrew Carnegie mansion, which is now the Cooper Hewitt Museum of Design on the southeast corner of Fifth Avenue 91st Street, is somewhat similar in tone with the Vanderbilt mansion but less prominently sited and oriented. The north facade of Bergdorf's faces the rear of Karl Bitter's graceful statue of "Pomona" that stands astride the top of the multi-tiered Pulitzer Fountain. 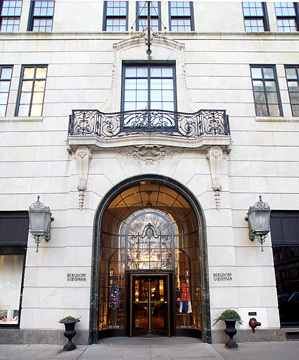 It has a very fine, arched entrance with curved glass and the building also has very handsome bronze lanterns at its entrances.